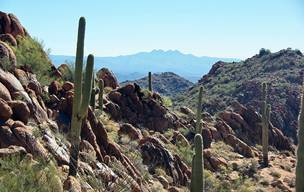 Explore the scenic Sonoran Desert with an experienced guide. Learn about local plants, animals, geology, and history. A variety of treks are available, from modest rolling desert to challenging mountain terrain. Hiking shoes are recommended, but any sturdy athletic footwear will do. Wearing a hat is a good idea. We’ll supply a waist pack, water bottle, and transportation. • Classic 3.2-mile loop hike. • Good choice for most hikers. • Up to 3.3 miles total -- out & back. • Dense stands of saguaro cactus. • Includes steep & rugged terrain. 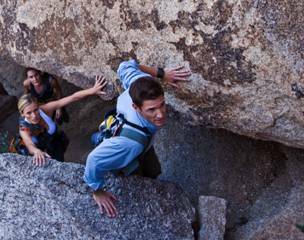 Follow a guide through the boulders on this short, but rugged, primitive path through raw desert habitat, just a stone’s throw from the resort. Get a close-up look at “Levitation Rock,” and 700-year-old Hohokam Indian artifacts. PLEASE NOTE: Wear athletic clothing suitable for the weather, and sturdy athletic shoes. are inherently dangerous activities. Safety will take precedence over all other concerns.